Jesse doesn’t know what kind of performance enhancing drugs fellow WWU college student Ariana Grace is selling, all he knows is that they work. And that’s good, because he’s in a whole lot of trouble. From his stripper girlfriend, to a Mexican gangster, to a killer game of soccer, Jesse’s in over his head and he’s going to need all the help Ariana can give him. 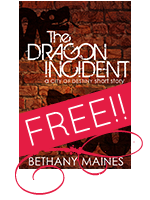 Join the Blue Zephyr reading group and receive a free copy of The Dragon Incident by Bethany Maines in the format of your choice through BookFunnel!